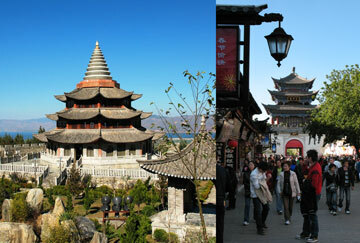 One of the best-known scenic places in Yunnan Province is Dali. These photos are from our trip to Dali with Michael's parents in 2007. 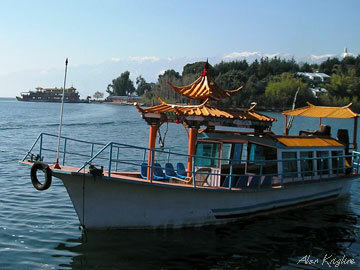 Dali offers a beautiful lake, an ancient town, and breath-taking views of snow-capped mountains. We hired a van and tour guide for an overnight trip from Kunming (it is about four hours down the highway). This view is from a small island on the far side of the lake, opposite to the ancient town. (Left) The boat that took us to the island. (Above left) Part of a movie studio complex in the hills above the ancient town (above right). I can't say enough about our short trip. The food was good, the hotel was nice, and the sights were beautiful and interesting. 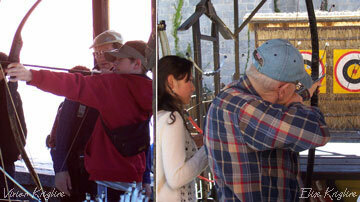 (Right) The movie studio offered us a chance to use a bow and arrow--Andrew particularly enjoys the chance to have such hands-on fun, but Michael and his dad enjoyed it too! Our van circled the lake on the second day, offering great views of the mountains. We had left Kunming Friday morning and were back for a late dinner on Saturday. The circled portion of this photo (and the inset enlargement) shows one of Dali's most famous sights: three ancient pagodas near a monastery. Because of our limited time, we only saw them from afar, but we did get to walk through the town, and also experienced a traditional tea ceremony. This shot was taken from the movie studio; the ancient town is between us and the pagodas.